Reference number for this case: 16-Oct-54-Haguenau. Thank you for including this reference number in any correspondence with me regarding this case. The regional newspaper L'Alsace for October 19, 1954, reported among other observations that day, that in Haguenau, on October 16, 1954 at 07:30 p.m. a "round and red craft" crossed the sky from the north to the South, followed by a "bright white and orange trail." The two authors indicate that in Haguenau in the department of the Bas-Rhin, on October 16, 1954, at an unspecified time, several people saw a shining machine having the shape of a melon and leaving a trace of orange white color. "Haguenau - 67 - towards 07:30 p.m.: no investigation. Obvious description of a fireball." They suspect that the exact time is not 07:30 p.m. but 09:30 p.m., which joins the case to the series of the observations of the meteor of 09:30 p.m.. Among briefly mentioned cases fot this date, he indicates that on October 16, 1954, at 07:30 P.M., in Haguenau, a machine of round shape and of red color followed by a white and orange scarf crossed the sky from the north to the south. Luc Chastan indicates that in the Bas Rhin in Haguenau on October 16, 1954, at ane unknown hour "Several people saw a shining machine having the shape of a melon and leaving a trace of orange white color." Barthel and Brucker were right to note that this was the obvious description of a meteor; but there was no need to claim the hour must have been 09:30 p.m. Nothing prevented another meteor before, at 07:30 p.m., as other reports in this catalog show. Their will to change the hous was accompanied by the silencing of the North to South direction, which is not at all that of the meteor at 09:35 p.m. This was probably the meteor of 07:30 p.m. of that day. 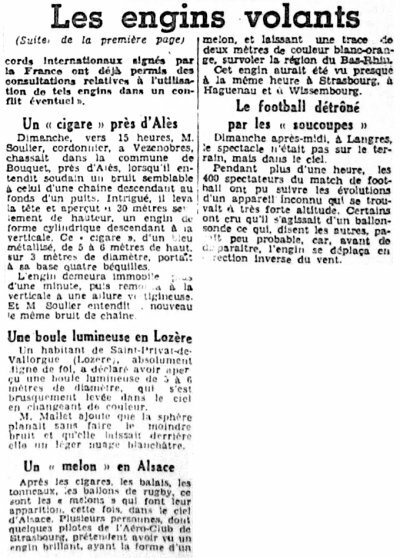 [lm1] Article in the regional newspaper Le Méridional, France, page 10, October 19, 1954. [fr1] "OVNI - Premier Dossier Complet des Rencontres Rapprochées en France", book by Michel Figuet and Jean-Louis Ruchon, Alain Lefeuvre publisher, France, page 175, 1979. [bb1] "La Grande Peur Martienne", book by Gerard Barthel and Jacques Brucker, Les Nouvelles Editions Rationalistes publishers, France, pages 202,205, 1979. [lc1] Base OVNI France, website by Luc Chastan, France, 2005, at baseovnifrance.free.fr/listgen.php?typlist=9&page=0&numobs=1052. 1.0 Patrick Gross December 26, 2009 Conversion from HTML to XHTML Strict. First formal version. Additions [lc1]. 3.0 Patrick Gross April 29, 2014 Additions [la1], [cv2], Summary, Explanations. 3.1 Patrick Gross June 12, 2015 Addition [sp4].